Climate researcher and writer, David Kroodsma will be paying Corvallis a visit for a book signing and slide show of his incredible journey documented in his book, The Bicycle Diaries. 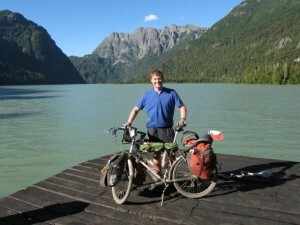 With a passion for communicating climate science to the public David completed a 21,000 mile bicycle journey spanning North and South America. You can learn more about his journey at the Ride for Climate website. Or come hear him speak! Sponsored by 350Corvallis, UUFC Climate Justice Group, Mary’s Peak Group – Sierra Club, and the OSU Environmental Sciences Club.